I attended this evening’s the Rec & Park Department (RPD) meeting about the plan to lease out the JP Murphy clubhouse. I’ve written about it twice, (here and here) but hadn’t attended the earlier meeting. 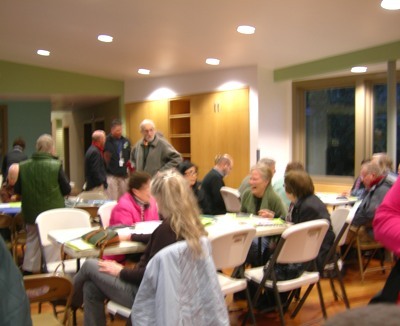 A large number of neighbors attended (I’d estimate 80-100) — the room was full. There was some annoyance at the layout. Instead of theater-style seating, it was restaurant style. Chairs surrounded a number of plastic kiddy tables arranged all about the room. It was awkward, especially for anyone in a wheelchair or with movement issues, because there were no clear aisles. No one could understand why. When the meeting started, it was explained. Speaking for Rec & Parks, Bob Palacio (present there with Nicole Avril, Lev Kushner and Alex Randolph), told us the planned format for the meeting: Breakout groups, coming together at the end to report on what they’d discussed. Bob tried to push through the format that had been decided on; no one was buying. “It’s our meeting,” someone yelled. “We pay your salary.” For a minute, it looked like Rec & Park would walk out. Saner counsel prevailed. Once it was decided this wasn’t going to be a meeting to vent dissatisfaction with Rec & Park, and we’d stick to the agenda, Bob salvaged the situation. (He offered to meet with anyone who wanted to complain, one on one.) We moved forward — in a single group, not broken out. What sort of recreational programming do you want to see at JP Murphy? Thinking of another recreational facility you liked, and what did you like about it? When did you last use JP Murphy, and for what? Do you know of any non-profits that offer these types of programs? The idea, Bob said, was to find a lessee who could provide the kind of programs neighbors want. Currently the clubhouse is rented out for birthday parties and the like. If it were leased out, only the clubhouse would be leased. The lessee could use public areas like everyone else, not exclusively. The bathrooms, outdoors and indoors, would remain open and available to the public. “It has tables and benches,” someone said. “There are other tables and benches…” responded Nicole, and there was silence. The point had been made. Even one trivial instance cast doubt on the earlier assurance. 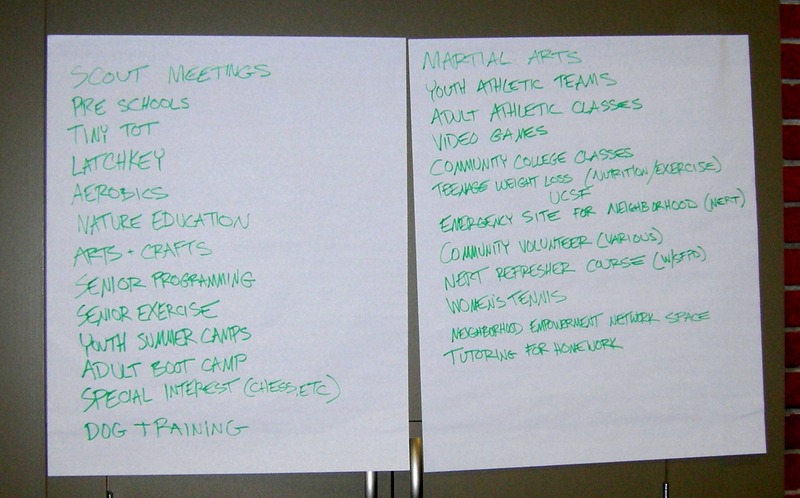 The meeting moved on to Question 1: Ideas for recreational programming. Ideas started flying. Lev Kushner noted them down on butcher paper. Many of them were for small children, and someone noted that the playground’s configuration — enclosed, back from the road — made it especially safe for little ones. That value, she suggested, should be preserved. From the applause, it sounded like the most popular ideas (besides things like Tiny Tots and other kiddy activities) were Community College classes (suggested by John Rizzo, who’s on the Board of City College); and NERT emergency preparedness in cop-operation with the Fire and Police Departments. There was talk of involving Neighborhood Empowerment Networks (NEN). All these ideas were good, but how could they be implemented? How much money was required? Would it be all or nothing, someone wanted to know. Would one non-profit have to provide all the services? Nicole said that one could act as a sort of “lead agency” and allow others to provide the classes or activities they didn’t. Apparently, at one clubhouse, Self-help for the Elderly uses the clubhouse in the mornings, but then keeps it open for other activities in the afternoon. This sounded like a reasonable arrangement (though some people had some negative things to say about that organization in its South Sunset location). 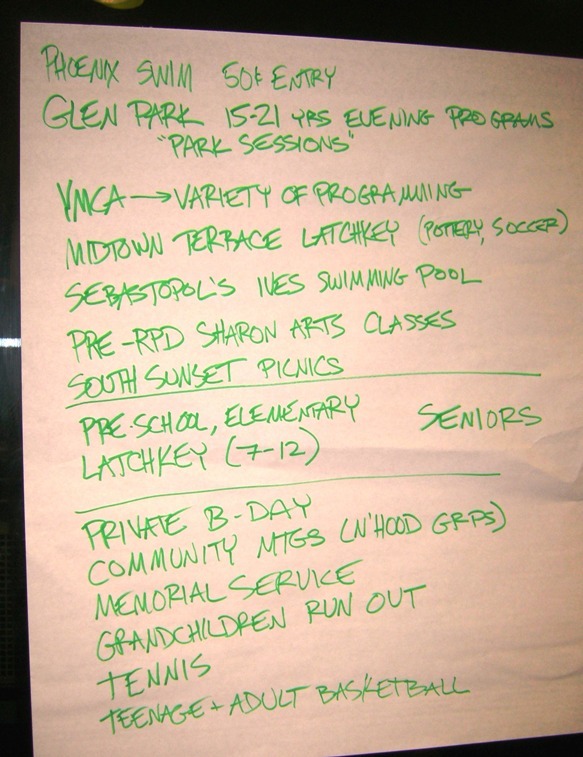 The list of what people liked at other centers was quite diverse: Swimming programs; “Parks Sessions” for young adults with dancing, skateboarding, poetry-reading and other activities; tennis; latchkey with pottery and soccer; picnic tables and benches. One person mentioned Sharon Art Studio in Golden Gate Park before it raised its prices and restricted its hours. Then it was on to Question 3: What have you used JP Murphy for? And someone remembered the teen dances. Someone pointed out that RPD’s drive to raise money to fill budget gaps ($6.4 million shortfall in 2011) is self-defeating. The following year, the city assumes that RPD can raise fees or start charging for formerly free activities, and reduces its support still further. Though San Franciscans are very supportive of their Parks — every bond measure has passed — they’re not getting the services they paid for. The only way around this is for citizens to advocate for RPD with City Hall. The Next Steps part was unclear. RPD is taking this information back to evaluate it, and will look for ways to fill the community’s desires for programming. “JP Murphy has been dark for way too long,” said Bob. When? people wanted to know. Lev didn’t want to commit to a time table. “Six weeks is too short, and two years is too long,” he commented. By this time, people were starting to leave, so Bob attempted to determine priorities. It seemed like programs for tiny kids and latchkey kids were a priority, but also classes and activities — like aerobics — for adults and seniors. There was talk of providing classes led by volunteers. There were some questions about how meetings would be publicized; people had missed the earlier one since they didn’t know about it. Bob said they would work with community groups, email lists, The Friends of JP Murphy Playground Facebook page, and put a large door sign at JP Murphy. 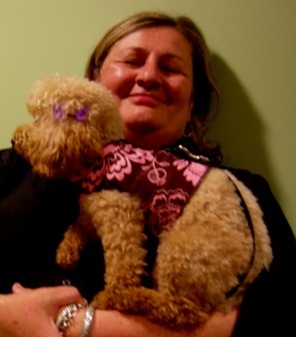 Then we all left, including the meeting’s cutest attendee: The best-behaved little poodle it’s been my pleasure to meet. Thank you for such an excellent write up. We visit JP Murphy with our 15 month son all the time, and didn’t realize any of this was going on. Unfortunately it often seems the city employees making decisions don’t understand the needs of the neighborhood. They want to make people happy, but don’t understand how to do it. I hope they read this report and keep involving the community, maybe with better posted signs so we attend next time! It appears that you have done that which no other public group has: you successfully made the meeting yours! The whole point of the “break-out” groups and having attendees separated by tables is a device to control a meeting so that the attendees are divided, both physically and topically. RPD uses the Planning Dept’s method of the “divide-and-conquer” tactic. By refusing this seating method, you managed to upset RPD’s apple cart altogether. I was really impressed with the show of support from the community, and people speaking up. Also, as was previously mentioned, the group did not fall for the “divide and conquer tactic” of a meeting set up. We held our ground! I just hope that SFRP takes us seriously, and promises to post the next meeting publicly. It would be such a shame to loose this gem of a park, in our neighborhood due to bureaucracy. I mentioned the Stow Lake issue in a post about the place last April. I’d be happy to do a followup in March or April, or post an article if you wish to send me one.